You are here: Home / Jewelry / Earrings / 3 under $300: treat yo’self kickoff edition. 3 under $300: treat yo’self kickoff edition. I’m going to be introducing a new feature today: the Friday 3. Sometimes the three will have a theme, sometimes they won’t. They will always be under $300, and there will (probably) always be 3 of them. I love featuring magnificent, aspirational jaw-dropping jewels. But I thought it might be fun to have a dedicated space for jewelry that a wider group of us might be able to actually buy. Because while I wear Cartier in my dreams, in real life I take public transportation to my full time job. Jewelry should be for everyone, regardless of bank account (or trust fund, as the case may be). I’m going to keep the writing brief in these so I can focus my energy of finding lovely and affordable beauties to present for your admiring (and potentially purchasing) pleasure – expect these to feel more like a gift guide post than a full jewelry post. “Downton Abbey” gold-tone Edwardian style pendant necklace with rhinestones ($25). Dana Kellin Starlight Fringe necklace with pale blue and lavender quartz ($162). 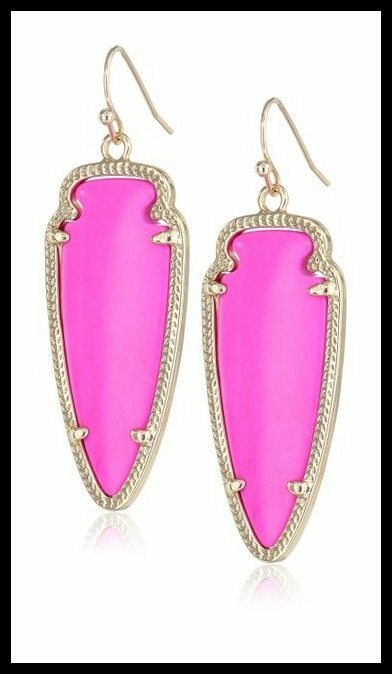 Kendra Scott “Signature” Sky gold and magenta color drop earrings ($55). Oh lovely, especially that blue-and-lavender quartz, Very summery.